Lila Downs has one of the world’s most singular voices and innovative approaches to music. She is the daughter of a Mixtec Indian woman, Anastasia Sánchez, who ran away from her village at 15 to sing in Mexico City cantinas and a University of Minnesota professor, Allen Downs, who saw her singing and fell in love with her. Lila grew up both in Minnesota and Oaxaca, and her music and vocal artistry has many influences, including the folk and ranchera music of Mexico and South America and American folk, jazz, blues and hip-hop. Many of her lyrics focus on issues relating to social justice, and often tell the stories of the workers who migrate from rural Mexico to work in the U.S. She studied classical voice and cultural anthropology at the University of Minnesota. The Mexican American singer has a stunning voice, a confident multicultural vision grounded in her Mixtec Indian roots –Los Angeles Times. Ms. Downs has multiple voices, from an airborne near-falsetto down to a forthright alto and a sultry, emotive contralto –New York Times. She and her husband / longtime collaborator, Paul Cohen, have produced 11 studio albums, with Pecados y Milagros having earned both a Grammy and a Latin Grammy award, and achieving double-platinum in sales in Mexico. She received her first Latin Grammy for the 2004 release, Una Sangre. Her 2014 project, RAÍZ, is a collaboration with Argentinian singer Soledad Pastorutti and Spanish flamenco singer La Niña Pastori. This album garnered two 2014 Latin Grammy nominations for Album of the Year and Best Folk Album. Her latest album is Balas y Chocolates. 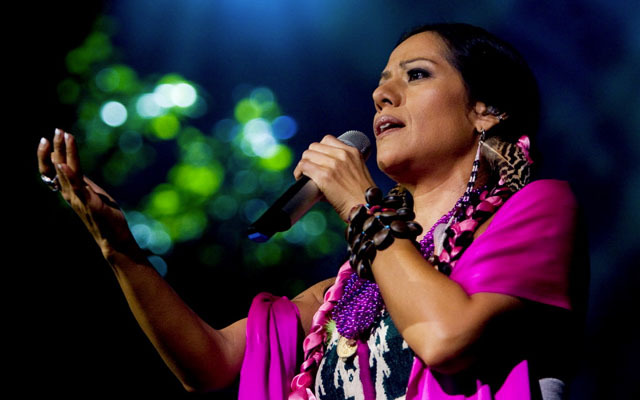 Lila Downs has performed at many of the world’s most prestigious festivals and venues including Jazz at Lincoln Center, Carnegie Hall and the Festival of Sacred Music – Hollywood Bowl. She has been invited to sing at the White House, and performed on the 75th Annual Academy Awards and the 2012 Latin Grammy Awards televised ceremonies. Her music has also been included in several feature films such as “The Counselor”, “Tortilla Soup,” “Real Women Have Curves,” “The Three Burials of Melquiades Estrada,” Carlos Saura’s “Fados,” “Mariachi Gringo”,“Frida” and “Hecho en Mexico”.